The Civil Aviation Authority is threatening already squeezed British commercial drone operators with another licence fee hike from April, piling another 40 per cent onto their costs. Drone fliers who make money by selling pictures and videos taken with their drones are furious over the CAA's proposal, which came to light in a general consultation about increasing licensing fees across all commercial aviation sectors. In the UK, a commercial drone operator's licence – formally known as a Permission for Commercial Operations* – currently costs £173 for an initial grant and £130 for a renewal (PDF). Licences run for 12 months from the date of grant. Back in 2016, (PDF), an application was £112 and a renewal £56 so the contemporary price list is already 155 and a 232 per cent higher respectively. The CAA has now proposed raising the price by another 40 per cent, prompting anger from the drone community, many of whom have claimed the regulations are not enforced – meaning those already licensed face fee hikes while the great unlicensed continue to remain fee-free. "The CAA fail to acknowledge this year's hike in price. My 2016 renewal was £56 and 2017 renewal £130," fumed Gerald McGivern, one of the UK's 3,500 licensed drone operators. In the 2018/2019 statutory charges consultation document (PDF, 30 pages), the CAA says it will be "increasing the current UAS [unmanned aerial system] 2017/18 application charges by 40% with effect from 1 April 2018" (to around £242, by El Reg's calculations). The CAA declined to comment when we invited them to do so, instead pointing us back at the consultation document. That stated the organisation aims to use the £300,000 raised by jacking up fees to reduce application turnaround times "from currently on average 90 days down to 15 days in respect of standard permissions", adding that "industry is most keen for the CAA to achieve this soonest". McGivern, who was scathing, told The Register: "They say that it will improve the service but we all know that that won't happen, maybe short term but after a year I'm willing to bet the delays will be back to normal... All the rogue drone activity is by non-PfCO holders yet there are no plans to clamp down on these people." Other benefits of the fee hike, according to the CAA, include "increased capability to conduct more NQE [National Qualified Entity, i.e. drone company] site visits to ensure standards in UAS operations are being maintained." 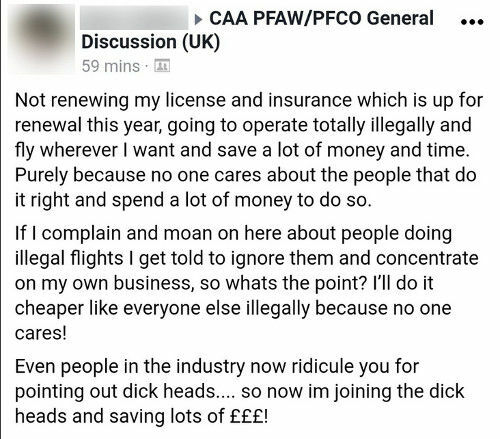 The CAA was insistent, on its website, that a PfCO is not a "licence". El Reg's understanding of the term is "permission from a State agency to do something that is otherwise forbidden by law". Given that the Air Navigation Order has forbid commercial aviation operations (ie, taking aerial photos and flogging them on) without permission from the CAA, the drone PfCO scheme falls squarely within that. Doubtless there is some tedious legal reason they insist it isn't a licence, in the same way that vehicle excise duty is technically not road tax, though everyone knows that's precisely what it is.